As I type this, it’s 5.21am in Perth and I can’t sleep. Cross-country jet lag after my arrival from Sydney, where we are two hours (and a few decades, so the joke goes) ahead. Anyways, as I scrolled through Facebook, best pal of the sleepless, I came across this post. Now, this Camino forum always posts interesting and helpful threads, so I have no complaints about that. 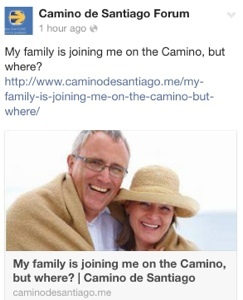 But I have a strong objection to the image – that guy is not walking the Camino with his family, that guy is THE MOST OVER-USED STOCK PHOTO MAN IN THE WORLD. Seriously, keep an eye out and you’ll see him everywhere – advertising things from pension funds to corporate promos to Father’s Day. I think he looks a wee bit like an Australian politician (Malcolm Turnbull), which is how he first caught my eye some years ago.